French President Nicolas Sarkozy claimed that Britain is a country with “no industry” during a prime time national TV broadcast last night. However, Nicolas Sarkozy’s claims have been ridiculed as “totally false” by his own Press. 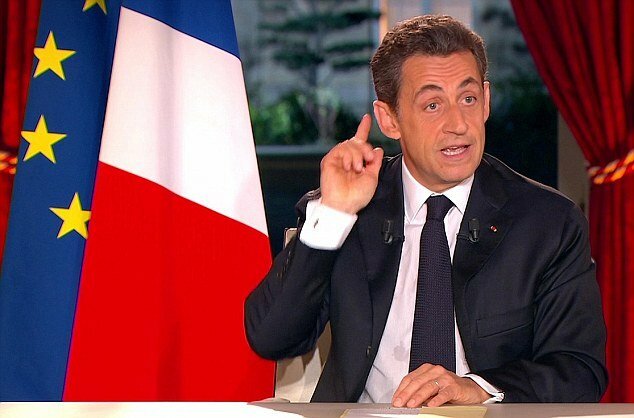 Nicolas Sarkozy made the extraordinary outburst as he defended a VAT rise during a prime time national TV broadcast last night. French president had just announced a 1.6% hike in VAT in a move designed to boost France’s failing economy. Experts across the Channel today pointed out that industry accounts for almost 17% of GDP in Britain – compared with just over 14% in France. It was newspaper Le Monde that branded Nicolas Sarkozy’s claim “totally false”, pointing out that “Britain is actually more industrialized than France”. According to figures produced by INSEE, France’s national statistics and economic studies institute, industrial production in Britain is almost 5% higher than it is in France. And separate figures from the OECD show that in 2009, Industry accounted for 19% of French Gross Value Added – a measure of the value of goods and services linked to GDP. In 2010, in the UK the figure was 21.8%. In manufacturing alone, the UK figure stood at 11.5% compared with 10.7% in France. Nicolas Sarkozy, who is hoping to be re-elected in the spring, is cutting an increasingly desperate figure as he fights to hold on to power. He said he was borrowing the VAT measure from Germany, arguing that it had “helped to boost German competitiveness” and had not led to a rise in prices. But in 2009 Nicolas Sarkozy claimed a similar VAT rise in the UK had “absolutely failed” to stimulate the economy. The 11th-hour measures are a risky political gamble as the hugely unpopular Nicolas Sarkozy lags behind Socialist rival Francois Hollande in the polls. Opinion polls also suggest the majority of the population is against an increase in sales tax, which will eat into their spending power. It is not the first time Nicolas Sarkozy, who came face-to-face with Prime Minister David Cameron at an EU debt summit today, has expressed his dislike of his cross-Channel neighbors. And today’s meeting – where EU leaders will sign off on a permanent rescue fund for the eurozone – could potentially herald a repeat of “Le Snub”, when the French leader refused to shake David Cameron’s hand after the Prime Minister vetoed proposed changes to the EU treaty in December. Nicolas Sarkozy was not questioned on the latest comments by any of the carefully selected journalists assisting with the broadcast from the Elysee Palace. Despite Nicolas Sarkozy’s previous view on such measures in the UK last night he saw the VAT rise as an essential measure to reverse his country’s fortunes, as he praised Angela Merkel for applying it. It came as the German Chancellor offered “active support” at campaign rallies for Nicolas Sarkozy, who is widely expected to fail in his re-election bid. A “Robin Hood” tax on financial transactions was also imposed by Nicolas Sarkozy last night – despite fierce opposition from EU leaders including Prime Minister David Cameron who described it as “utter madness”. The 0.1% financial transaction levy will be introduced in August in France regardless of whether other European countries follow suit. The tax is part of a package of measures set out by the president to promote growth and create jobs. French and German proposals for the EU-wide financial transaction tax were among the reasons that British PM David Cameron vetoed EU treaty changes at a summit in Brussels in December. The tax is intended to dissuade speculators from making very short-term investments in foreign exchange. David Cameron argued that the so-called “Tobin Tax” – named after American economist James Tobin – would penalize the City of London, where 75% of European financial transactions take place. Earlier this month, PM David Cameron vowed to wield a second veto in Europe if France and Germany insist on pushing ahead with the EU-wide tax. “With tax on financial transactions, we are going to show an example,” said Nicolas Sarkozy last night, as he outlined the tough new measures in the hour-long broadcast, which was shown by eight channels. While officially a presidential address, Nicolas Sarkozy made it clear that all of his attention is on the two-round presidential election to be held in April and May. But he remains unpopular among voters. Not only are some 3 million people currently unemployed in France, but the country lost its triple-A credit rating from Standard and Poor’s earlier this month. The decline of Nicolas Sarkozy, a right-wing conservative, is seen as Francois Hollande’s greatest asset, and last week the Socialist candidate launched an impassioned attack on “the world of finance”. Francois Hollande, who was nominated to be the Socialist Party and Left Radical Party candidate in the 2012 French presidential election, has promised huge tax rises, some 23 billion euros in new spending by 2017, and 150,000 state-subsidized new jobs for young workers, as well as 60,000 new teaching jobs. But Angela Merkel on Saturday pledged to support Nicolas Sarkozy on the campaign trail, because she apparently doubts Francois Hollande’s ability to solve the Eurozone sovereign debt crisis. Angela Merkel and Nicolas Sarkozy have built up such a strong working relationship that they are referred to as “Merkozy”. The latest opinion poll published this weekend suggested Francois Hollande would take 56% of votes in the second round of the election, with Nicolas Sarkozy on 44%. Nicolas Sarkozy, who turned 57 on Saturday, has been involved in numerous scandals since coming to power in 2007. Magistrates are currently looking at allegations that Nicolas Sarkozy and other senior members of the ruling UMP party received envelopes stuffed full of cash from Liliane Bettencourt, the L’Oreal heiress and France’s richest woman, in return for future tax breaks. Nicolas Sarkozy’s third wife, the former supermodel Carla Bruni, has also been accused of enriching close friends in Paris through her charity work.